Working on tasks involving fine-motor-skills tends to take Max a while, because his fingers don't move the way he wants them to. Grasping a spoon involved months and months of effort when he learned how years ago. Holding a pencil and a toothbrush are still a challenge, not uncommon among people with spastic cerebral palsy. Max often manages to make due, clinging to stuff with all his might. At times, of course, he gets frustrated. He also knows we'll do stuff for him, which can impact his motivation. But Max likes to make people happy. Since becoming a teen, he also likes to be right. 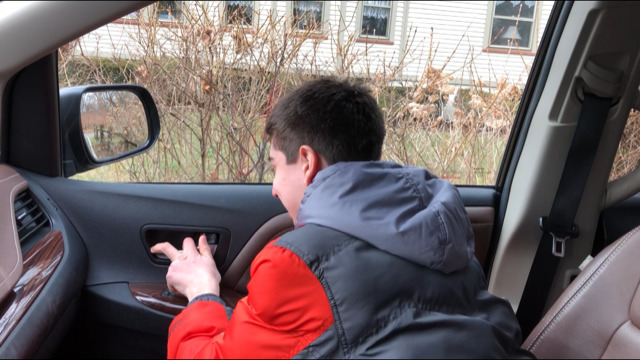 And so, when I asked his OT a few weeks ago to sit in the car with him and work with him on opening the car door, I had a feeling Max would pull it off. I had no expectations for how long that would take. It didn't matter, really; there is no rush, or finish line. As I often say, Max is on his own timeline and nobody else's. The OT tried one week, and said Max would get there—he just needed to be reminded to use several fingers to pull the car door lever. The next week, the OT was sick. And then, I was at work last week and this video showed up and I did a happy dance in my seat. MAX!!! Yet another one of those small-yet-major moments, and yet another step toward independence. Over the weekend, Max let himself out of the car a couple of times, grinning the biggest grin. A few times, he tilted his head to the side and said "Ugggh!" (his version of the eye roll, which he hasn't yet mastered and I hope he won't because one eye-rolling teen in the house is enough), then insisted that we do it for him. But it looks like this is going to stick.